Fourteenth day/night of the London Blitz. On Friday 20th September 1940, an Unexploded Bomb was reported at the Metropolitan line's Neasden Depot, in sheds between roads 17 & 18. 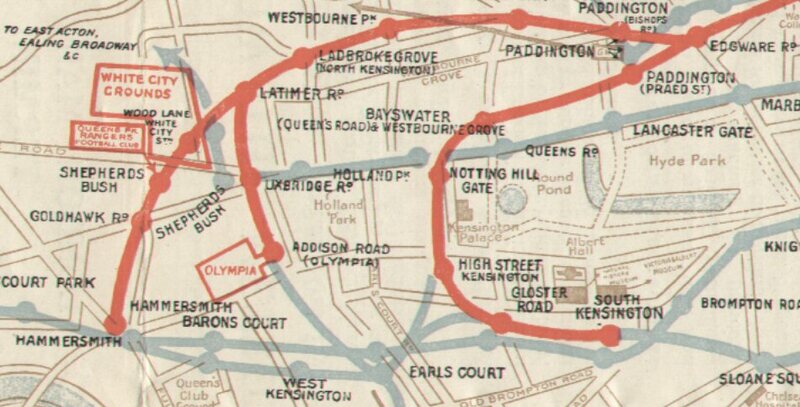 On the District line, Earl's Court to Parson's Green services were suspended due to a Delayed Action bomb (DA) at West Brompton, while services were resumed between Ladbroke Grove and Addison Road (see map below) at 16:10 on the 20th. 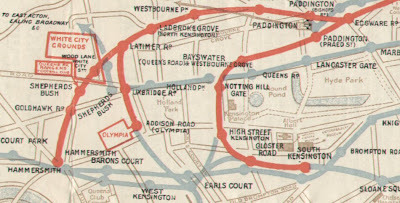 Northern line services between Golder's Green and Brent (now Brent Cross) were suspended due to a DA. A DA was reported adjacent to the track at Alperton station at 21:15; trains were reversed at Ealing Common and South Hounslow. At 21:28, nearby fires closed Lambeth North station on the Bakerloo line. There was further disruption at Wood Lane area, when a DA was reported between there and Action; trains reversed at Wood Lane.